As I talked with David Taylor, assistant professor of theology and culture at Fuller Seminary and director of Fuller’s Brehm Texas, for my preview of the film he made for Fuller Studio, Bono & Eugene Peterson: The Psalms, he kept coming back to friendship and honesty, themes he thought were woven through the whole project. The film would not have happened, Taylor said, without the help of friends. And as Bono, Peterson and Taylor all said in their own ways, the Psalms challenge us with their honesty. Taylor also mentioned that after their initial filming in Montana, Bono asked to meet again in New York City to continue the conversation. Naturally, I wanted to come back to that and ask Taylor what else Bono had on his mind. 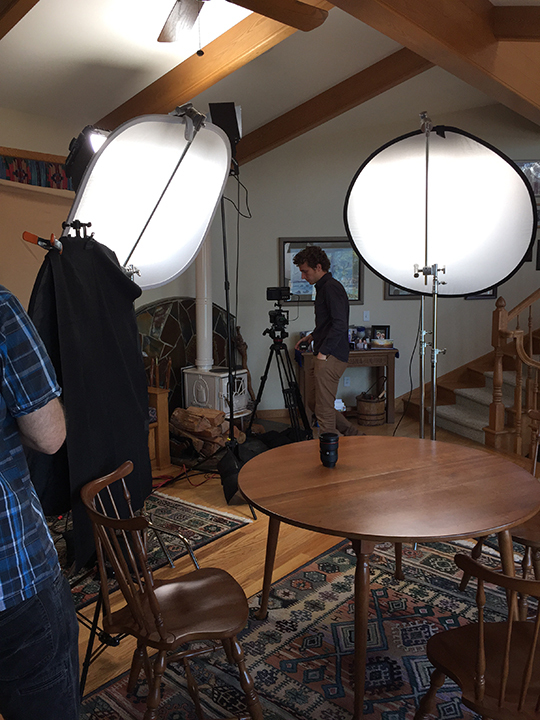 I also reached out to those friends who helped Taylor from behind the scenes -- Charlie Peacock, Nathan Clarke and Makoto Fujimura -- to ask about their roles in making this film. 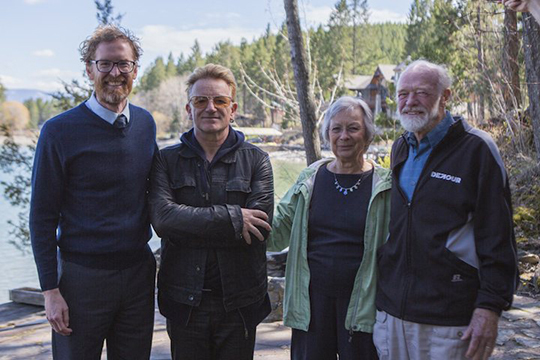 Keeping in mind, too, that the film is a work of art about artists who strive for honesty, I asked them to share how they have been influenced by Bono and Peterson. After several attempts to find a time when Bono and Peterson could meet, it turned out that right in the middle of U2’s rehearsals for its impending Innocence + Experience tour was a good time for Bono. He left rehearsals in Vancouver to fly to Montana on April 19, 2015, intending to fly back to Vancouver that same day. Taylor said that after some off-camera greetings and private conversations between Bono and Peterson, they only had an hour for the on-camera conversation. Taylor said, “I spent a third of the time asking them questions about their friendship over the years. That left only 40 minutes for us to talk about the Psalms. 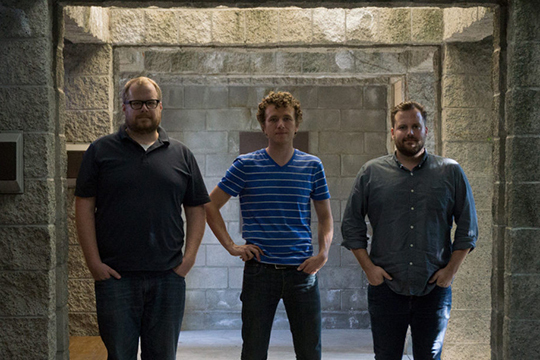 We barely scratched the surface.” The final cut of the film was a little under 22 minutes. Taylor asked his friend Nathan Clarke of Fourth Line Films to direct the film because Taylor admired his previous short-documentary storytelling work. Also, Clarke is a U2 fan. Clarke and his crew arrived at Flathead Lake, Montana, a day before the shoot to get the lay of the land and spend some time with the Petersons. In the film, that sense of ease comes through in the scene where Eugene makes coffee and Jan bakes cookies to prepare for their guest. “There is a comfort in those moments that, to me, are my favorite shots in the film,” Clarke said. Clarke told me his and cinematographer John Harrison’s main motivation was to capture the essence of a relationship for this film. That second interview took place July 29, 2015, at the International Arts Movement gallery in mid-Manhattan. “Knowing that Bono had a special appreciation for visual art, I wanted to see if we could find a gallery in which the conversation took place. I called my friend Makoto Fujimura and asked for his advice,” Taylor said. As the founder of the IAM and a member of the board of directors, the internationally renowned artist and writer Fujimura offered the space. When Bono arrived for the interview, Fujimura showed his painting “Splendor-Ghost" to him. 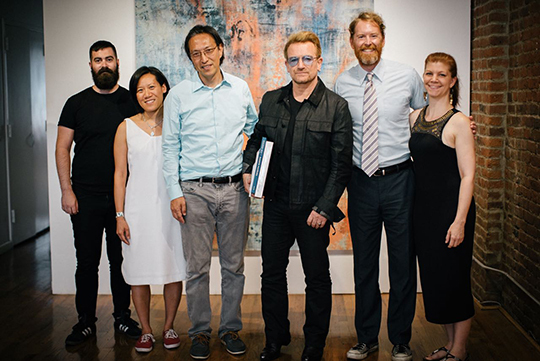 “Bono really liked the painting, and I am glad that he felt comfortable in our space as it became one of the last events there before we closed the gallery,” Fujimura said. Taylor’s two meetings with Bono left him thinking Bono was “frightfully intelligent when it came to the matter of the Psalms. He is a serious student of them -- their history, their poetry, their themes, their various uses. I was thoroughly impressed.” Knowing Taylor is an associate professor of theology and culture at Fuller Seminary, I asked him what impressed him so much. When they met again in July, “it was patently evident Bono had more to say,” Taylor remarked. The rest of the conversation in New York City came back to themes they had talked about with Peterson in Montana, Taylor said. They explored their understanding of the relationship between the arts, on the one hand, and the experiences of suffering, growing older, mortality and death, on the other hand. “It was a fascinating part of our conversation, it goes without saying,” Taylor admitted. In Taylor and Clarke's film, as Peterson and Bono discussed the role of honesty in life and art, especially when Peterson talked about not wanting to escape from or avoid real-world problems, I was reminded of how he ended a conversation with me in 2006, when we talked about U2’s music. I had asked all my questions and thought we might be finished, but then I asked Peterson if he wanted to offer any more comments. He did, and he wanted to talk about honesty. The spirit of the Psalms prompting Bono to ask for more honesty in Christian art, and from the artists themselves, is a hip-shot Bono’s loaded and launched before, most notably in his 1999 Introduction to Selections From The Book Of Psalms, in his 2006 Leadership Summit interview with Willow Creek’s Bill Hybels, and in his 2013 interview with Focus on the Family’s Jim Daly. Also, although he hasn't made public comments that are archived and searchable about the subject, I would think Bono's been surveying the contemporary Christian music scene and talking about wanting more honesty from Christian artists since the early 1980s, when U2 intentionally navigated a course away from being labeled a contemporary Christian music act itself.